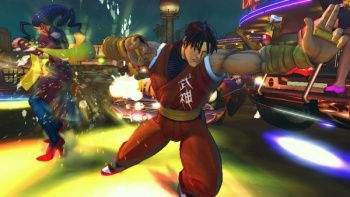 Street Fighter IV producer Yoshinori Ono teased that he would be announcing more than one project tomorrow at Comic-Con, lending weight to the rumors that he would be unveiling a pair of crossover fighting ganes. Earlier this week, it was rumored that Capcom and Namco were working on a joint project - a pair of crossover "Versus" fighting games. According to the rumors, Capcom vs. Namco would be developed by Capcom in the style of Street Fighter, whereas Namco vs. Capcom would be developed by Namco in the style of Tekken and Soul Calibur. The games were supposedly scheduled to be announced this weekend at San Diego Comic-Con 2010. "I'm not only announcing one new 'something'," said Ono, "Nor just two. But I would like to talk about a few of our recent endeavours." The specific phrasing "nor just two" seems to indicate that Ono is well aware of the vs. Namco rumors, and the announcement that he will in fact be announcing multiple projects gives those rumors some extra weight. However, the news that Ono would be revealing more than two projects is new. Other than the Namco collaboration and Marvel vs. Capcom 3 (which doesn't exactly count as a "new" project), what could be up Capcom's sleeve? We'll find out tomorrow: Ono's panel at SDCC is scheduled for noon PST (3:00 PM EST).